Go paperless with our fully automated document management solution. Folder Watcher is a combination of Windows® .NET components that are able to watch specified drive folders and executes automated commands when file changes occur. Successful companies are always looking for ways to save time and money, become more efficient, and grow their business. We know that personnel spend too much time filing and searching for documents that they need in order to perform meaningful tasks. The goal with a document management solution is to reduce that amount of time as much as possible because the less time personnel spend shuffling paper the more time they have for meaningful tasks. Put your documents in the scanner, push a button, and walk away. Metridoc takes over from there, it will automatically recognize your scanner output, and immediately start processing documents. It will determine the type of document, capture text data, convert the image to a full text searchable Adobe® PDF, and automatically catalog the document in the system without any human interaction. You should find that 90 percent or more of your document identification can be fully automated. There is no need to set up a customer record, or “drag and drop” every document. Metridoc not only gets rid of the paper, it gets rid of the filing process and the related labor. This is the definition of a fully automated document management solution. Compared to a pile of papers, the paper must be sorted through and organized, cataloged and indexed, and then filed away. As a fully automated document management solution, Metridoc takes on the duties of sorting, organizing and filing away documents. The Metridoc system automates the process of filing documents; therefore the user does not have to spend time filing documents. The process of organizing, sorting and filing documents away is all done while the user is doing something else. Using a fully automated document management solution, such as Metridoc, is a valuable application for companies because less time is spent filing documents and more time is spent doing other work related activities. While the user is working on something else Metridoc automatically starts to process the scanned documents. The system first acknowledges that a document has been scanned into the system. Metridoc uses folder watchers to search for incoming documents, which are used to automate the document processing procedure. The folder watchers recognize that the system has acquired a new document, therefore the document is automatically processed by Metridoc. It is important that the document type is identified by the system; Metridoc automatically identifies and captures the needed information off of the scanned document. The Optical Character Recognition (OCR) component that is incorporated with the system converts an image of text into text data. This enables Metridoc to automatically sort, organize and file documents away. Also each document that is scanned into the system is automatically converted to an Adobe® PDF file. Metridoc will automatically convert the scanned TIFF image into a full text searchable PDF file. Metridoc automatically catalogs and indexes the documents. The system uses the text data to automatically identify the document type and automatically populates any necessary document properties. The document type, and document properties have been validated by the system, and now the processed document needs to be filed away. Metridoc automatically adds the processed documents to the document storage, without any user interaction. In order to retrieve a document the user only types in a few keys words and the system automatically retrieves the necessary document. Metridoc automatically files all the documents, with little user interaction. The automation is important because it increase productivity therefore more customers are being served, more orders are being shipped, and more invoices are being processed – all with the same amount of employees. 1. Scalable and flexible information technology solution that replaces traditional costly manual paper filing methods with state of the art digital software components that automate the indexing, filing, searching, and archiving tasks of the usually document management cycle and more. 2. Cost effective way of eliminating the majority of your current manual filing system and apparatus you use to store paper documents such as motorized systems, shelving, file cabinets, folders, and labels as well as eliminating all of the labor efforts required to make a manual filing system work. 3. Method of reducing the size of your file room, increasing the size of productive usable space in your office, and eliminating any need your company may have to expand or build an additional file room. 4. Software solution that enables your company’s employees to very quickly retrieve and view documents they need to do their job without having to get up and leave their desk. 5. Technique for significantly increasing the productivity and efficiency of your employees by reducing the amount of time they spend looking for documents. 6. Document management solution that can be configured to run for a small workgroup or a large multiple site company. 8. Collection of document management software components designed to provide the features companies need for document management such as optical character recognition (OCR), PDF conversion, meaningful full-text indexing, unlimited user-defined document types, unlimited user-defined document properties, and multiple search methods, that automates document recognition and cataloging, has an easy to use web browser interface, that is priced very competitively and does not require separate user licenses. 9. Web based document management solution that runs on your information system and is not a hosted Internet solution that requires no installation, or administration, of software components on your client computer which translates to a lower cost of ownership. 10. Document management solution that integrates with your existing applications and scanner hardware. For more detailed information about Metridoc please contact us. Throughout this article we will offer some insight and our suggestions on these factors in order to make a smooth transition to a paperless office with the Metridoc solution. Once your Metridoc solution has been implemented, there is no need to use both paper and electronic documents. To get started scanning your documents, we recommend that you scan day forward. The term day forward refers to the new incoming documents that are received everyday that are needed to perform routine business activities. As each new document is received, immediately scan those documents into Metridoc. This will enable your most current documents to be readily available to your personnel. The new workflow process of using electronic documents will be an easier transition for your personnel because the use of paper documents is being reduced. Now that you have started with the new incoming files, starting to scan the existing files in the filing cabinets needs to be determined. If your personnel still need to access these files, than you may want to consider adding them to the system. Adding all of the existing files in the filing cabinet is a time consuming process if done all at once. We suggest that as a file is needed, pull the file from the filing cabinet. Instead of re-filing the document, have the entire file scanned into Metridoc. Once the entire file has been added to the system it can be archived immediately. The next time that document is needed it will already be available in the system. Within a short period of time more and more files will be available in the system, reducing the size of the filing cabinets. After the Metridoc installation process is complete you are ready to start scanning immediately. The sooner you start using Metridoc the sooner you will see an increase in productivity and see a return on your investment. Get started with the new incoming documents for the day, and any files that are currently being used by your personnel. Once the scanning has begun, notify your personnel that they can now use Metridoc to search and retrieve documents. After a document has been added to Metridoc it is not necessary to re-file the document, it should be archived immediately to a storage box. We recommend that users keep a storage box next to their scanner so as the documents come out of the scanner they can go right into the storage box. The storage box should be labeled with two dates: the date you started using it and the date that it was filled and sealed. When it is necessary to locate the original document, using the Metridoc Created date, locate the correct storage box, and remove the document. Once you are through with the original document place it back in the storage box. Locating original documents can be made easier by using partitions in the storage box for your routine document types such as orders, invoices, and vouchers. Storing your original documents by date avoids the annual file purging project and easily identifies documents that you can destroy by looking at the dates on your storage boxes. As illustrated above, the transition to a paperless office with the Metridoc solution is simple. Simply start scanning your new incoming documents once the installation process is complete. Personnel will be able to ease into the new workflow process when the most recent documents are available in the system. As for the existing files in the filing cabinets, when a file is needed, immediately scan the entire file into Metridoc. The file does not need to be re-filed; it can be archived once it has been added to the system. Within in a short period of time the files in your filing cabinet will be reduced, saving you space, along with an increase in productivity. The sooner you implement and start using Metridoc the sooner you will save your company money. How Does Metridoc® Organize Documents? Document groups are the top level of cataloging in the Metridoc Document Store and acts a partition between different divisions, departments, lines of business, or workgroups in a company. Only members of the group can access the documents in the group and in order to provide extreme privacy only members of a group know that the group exists because it is never displayed as an option for non-group members. Metridoc users may belong to multiple document groups and can change document groups for each search if they choose. You can create an unlimited number of document groups and you are required to create at least one. Your company is a home medical equipment (HME) provider and your business office wants to add your patient billing records to Metridoc so you create a “Business Office” document group and add the members of the business office to that group. Now only the business office members can search and retrieve documents in that group. Only the billing office knows that the “Business Office” document group exists. You also have a respiratory department that keeps their own clinical patient documents that they want to add to Metridoc so you create a “Respiratory” document group that only the respiratory department can access. Your human resource department wants to add their private and sensitive documents to Metridoc so you create a “Human Resource” document group and add the members of the human resource department to that group. Now only the human resource department members can search and retrieve documents in that group. Again, only the human resource department knows that the “Human Resource” document group exists. Your purchasing and accounts payable departments want to add their paperwork such as purchase orders, packing slips, and vendor invoices to Metridoc so you create a “Purchasing/Accounts Payable” document group that only they can access. Your company decides that they want a simple document catalog so you create a “Documents” document group and add each Metridoc users as a member of that group. Each document that is added to the Metridoc Document Store is identified with a document group and a document type. The document type classifies each document as to their nature. Metridoc searches can be performed for a single document type or can be performed across all document types. Searching for a single document type saves time by limiting search results to review when employees know the exact document type they need. You can create an unlimited number of document types and you are required to create at least one. For example, using the purchasing and accounts payable example above you would create three document types: “Purchase Order”, “Packing Slip”, and “Vendor Invoice”. Using the human resource example you might create “Employee Application”, “Employee Review”, “Injury Report”, or “Written Warning” document types. The HME business office example might create “Customer Order”, “DMERC”, “CMN”, “Medicare Voucher”, or “BC/BS Voucher” document types. Each document that is added to the Document Store by way of a Metridoc Document Processing workstation using the Metridoc ABBYY® processing plug-in goes through an optical character recognition (OCR) process where the Metridoc analyzes the type written characters on a document image and converts them to text data. The text data is part of each document and is available in later stages of the processing for document identification and document property mapping (see Document Properties) using text patterns. Each document’s text data is also indexed with the full-text indexing components in Metridoc’s back end database. This index is used during searches to retrieve documents. A basic text search will return results that match a certain character, word (a string of characters), or multiple words regardless of the context of the words on a document which is an issue because this increases the search results with documents that employees aren’t looking for. For example, when large health care providers receive payment from insurance companies they often receive hundred page documents listing patients and the claims that that the insurance company is paying. Performing a basic text search on a document of this kind will match almost any combination of name. For instance in a search for John Smith the word “John” may be found on page 5 and the word “Smith” maybe found on page 99 and that match would be totally out of context and it would be a waste of time for an employee to review this document result. A meaningful full-text search, as is used in Metridoc, takes into consideration the context of the criteria specified so if the two words John and Smith were not in the same vicinity, say within a few lines of text from one another, the document described above wouldn’t be returned as a result and your employee wouldn’t waste their time reviewing it when it isn’t what they need. Metridoc’s full-text searching defaults to a meaningful full-text search but the user can also perform a basic text search if needed. Meaningful full-text indexing is a valuable feature for a document management solution because there is significant time savings in finding your documents quickly. You don’t want employees wasting their time “browsing” through electronic folders, or reviewing documents that match their criteria but are out of context. One of Metridoc’s primary design goals was to maximize the automation of document management and meaningful full-text indexing delivers. Imagine having a person in your company who has stored every word on every page of every document in your business as well as where to locate that page, and anytime you needed a document you would tell that person what you where looking for, they would run down to the file room and pull the meaningful matches, and bring them back to your for review. Well that person is Metridoc. Each document type can have an unlimited number of properties, or fields, and each property is defined with a specific data type of date/time, integer, text, logical or decimal. Document property values can be modified by designated users after a document has been added to the Metridoc Document Store. The OCR only recognizes type written characters so Metridoc is unable to provide search capabilities on the parts of documents that are handwritten. 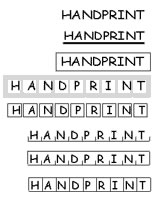 An optional intelligent character recognition (ICR) feature is available that recognizes hand print (see image below) but it doesn’t recognize cursive writing. When working with documents of this nature a document property can be created to capture the key pieces of data that you would use to retrieve the document. Maybe it’s a customer number, order number, invoice number, a significant date, etc. There are several ways of automating the population of a document property when it is being added to the Metridoc Document Store such as a default value, text processing and mapping with regular expressions, custom Metridoc plug-in, bar codes, etc. Each document property is defined as either being required or optional. All document property data is validated by data type before a document is accepted into the Metridoc Document Store and if a value is invalid for the data type the document is pended so it can be reviewed. If a document property is required for a certain document type then null data values are not accepted and will result in the document being pended for review. A previous example in the article discussed a large health care provider that may receive payment vouchers from insurance companies are hundreds of pages. Extending that example let’s say that the business office manager wanted to be able to perform a document search for all payment vouchers received on a certain day in order to audit daily cash receipts. None of the insurance payment vouchers would have on them the date the company deposited the payments in their bank so the manager could create document property named “Deposit Date” and define it as a required Date/Time data type. Now the manager would be able perform a search on a specific Deposit Date or a range of Deposit Dates. Old habits are hard to break and when using Metridoc employees still want to be able view the digital equivalent of a manual filing folders such as an employee file, customer file, vendor file, patient file, etc. Metridoc enables you to create that virtual file folder using a common document property across multiple related document types. For example, let’s say you wanted to have virtual employee file in your human resources department. When you define the document types that will be used in your employee file also define a common document property on each document type such as “Employee Number” or “Employee Name” or both. Make those document properties required and configure how you would like to automatically populate those properties. When the human resource personnel want to retrieve the virtual employee file the can perform a search across all document types for a specific employee. Metridoc will return all of the documents that match the specified employee and group them by document type for easy browsing of the virtual employee file. This same technique can be used with customer files, vendor files, patient files, etc. Generally, employees use the documents in your business for some type of process such as customer service, billing, receivables, payable, payroll, inventory, etc. Your business processes are made up of a number of steps for a particular process and you can define document properties such as “Workflow Status” and “Workflow Status Date” to record the current state of the process that is centered on a specific document. For example, you could add all of your vendor invoices received in the mail today and add them to Metridoc with a default Workflow Status of “New”. Your accounts payable clerk could then perform a search for all vendor invoices with the Workflow Status of “New” and the result would be all of the invoices that need to be processed in your accounts payable system. As each invoice is processed the user could modify the “Workflow Status” fields and update them back to the Metridoc Data Store to reflect that the workflow task has been completed. This same method can be automated to work with your existing software applications and remove the human element from certain tasks such as keying an accounts payable invoice. Using the health care provider scenario the same method could be applied to billing if the provider adds all of their completed orders to Metridoc. Metridoc Customers have used an integer Workflow Status property in this case where 0 means new, 1 means the billing office has verified the customer account or created a new account, 2 means a bill has been prepared, etc. Business office personnel effective use Metridoc as a work queue and the Workflow Status property defines their work center. As you can see Metridoc offers many flexible ways of cataloging and indexing your business documents, whether they are typed characters or hand print, from using automatic full-text indexing to simple yet sophisticated document properties that can be used to enhance document searching and automate basic document workflow. Wide area data communications or Internet VPN’s. Separate servers for the database, web service, and browser based user applications. Document storage can be on a local disk, network share, NAS, or SAN configurations. Single or multiple document processing workstations that can be local or remote to document store. Single or multiple scanners that output to a local or remote document processing workstation. The possibilities are almost endless and to put it simply: Metridoc can be configured to work for a small office using a single computer, or a larger organization with multiple locations and hundreds of users. The computer in the center is the Metridoc document store where all document images are submitted as part of document processing and all documents are retrieved based on user searches. This server would require Microsoft® SQL Server® database server and Microsoft® Internet Information Server® components to host the document store web service and the browser based user web application used to search for documents. Of course if your organization has a separate database and/or web server those Metridoc components can be hosted on those servers instead. The computer in the upper right corner is the Metridoc document processing workstation that in this illustration has a document scanner locally connected to it. As the documents are scanned they are output on the local drive of the workstation where the Metridoc components automatically take the scanner output and process it. Once processed the completed documents are automatically submitted to the document store and are ready for employees to use. This workstation is typically a dedicated desktop computer that can be running Microsoft® Windows XP®, contain at least of gigabyte of RAM memory, and has enough free disk space to accomodate the scanning volume until it is submitted to the document store (in most cases a few gigabtyes of free storage). We recommend the fastest processor you have available in order to accomodate the processor intensive OCR process. The computer in the lower right corner is optional and only serves to show that in higher volume document environments you can add as many document processing workstations as needed. The computers on the left side of the illustration represent any number of client computers (users) that access the system through any sort of connection to your Metridoc system’s browser based user interface. This can be a local network connection, a secure Internet connection, a VPN connection, etc. This enables employees who are in the office, working from home, or who are on the road access your Metridoc system. Metridoc is not licensed by number of users so you can have as many users as you would like have access to your Metridoc system. Again a Metridoc system can be configured for a small single location office environment or a larger multiple site environment. What Scanners Work With Metridoc®? Metridoc is a scanner independent solution meaning it will work with any scanner, device, or application. Metridoc is capable of integrating with existing hardware and software; therefore it is not necessary to purchase additional products. In order for Metridoc to work with a scanner, device or application the component must output a TIFF (Tagged Image Format File) to a disk drive. The disk drive can be on local computer that the scanner is attached to or on a network disk that is accessible to the Metridoc system. Also it is recommended that the device or application outputs a TIFF file at a minimum resolution of 300 dots per inch (dpi). This resolution is required because the 300 dpi is an optimal resolution for the Optical Character Recognition (OCR) engine that converts images of characters to actual characters of text. Metridoc will work with lower resolution images but the OCR engine may not recognize an acceptable amount of text or may not recognize characters as accurately. The file size of the scanner output does not determine the file size of the Metridoc processed Adobe® PDF. The PDF that Metridoc creates can use a lower resolution than the original TIFF file. The PDF files can be created at a lower resolution because the human eye can not distinguish between 72, 150, and 300 dpi. Pages Per Minute (PPM) – The scanner being considered should scan a minimum of 40ppm. Sheet Feeder – The scanner should be a sheet fed so that a batch of documents can be set on the scanner and the scanner feds the documents through the scanner. Not all scanners offer this feature and having to place each page of a document one at a time on a flat bed scanner can be a very slow process, which will take longer to get documents into the system. Black & White vs. Color – Color scanners create large output files because they have to store the color bits. Metridoc Document Processing will convert and store images but the processed PDF files will be about four times the size and take up four times the space compared to a black and white image. Also color scanning is usually slower than black and white scanning and most scanners will have a lower PPM when scanning in color. Black and white is recommended and is acceptable for the majority of businesses. Duplex Scanning – Duplex Scanning is the ability to scan both sides of a document. In Metridoc, each side is considered one page so one duplex scan is two pages. This feature is a preference to the customer. Separator Pages – Separator pages are a function of the scanning device and not a function of Metridoc. Does Medicare accept the electronic documents for audit purposes? The Medicare Program Integrity Manual, Section 5.3.3.1 – Acceptability of Faxed Orders and Facsimile or Electronic Certificates of Medical Necessity (Rev. 71, 04-09-04), states the following:“When reviewing claims and orders or auditing CMNs for DMEPOS, DMERCs and DMERC PSCs may encounter faxed, copied, or electronic orders and CMNs in supplier files. Generally, DMERCs and DMERCs PSCs should accept these documents as fulfilling the requirements for these documents.”This section is very favorable to electronic document management solutions but the section only states that the regional DMERCs, “generally” “should accept” electronic documents and each DMERC region implements their own policies. Another part of the Medicare Program Integrity Manual, Section 5.2.1 – Supplier Documentation (Rev. 71, 04-09-04), states:“Documentation must be maintained in the supplier’s files for seven (7) years.”We spoke with a DMERC Region D representative at Medtrade and their response was that they would rather use an electronic system to review supplier documentation because it is faster, but at any time during a review or audit they may request the original documents, especially if the electronic documents appear to be tampered with or fraudulent, and the supplier must be able to produce the original documents. Just because you may need to produce the original DMERC on a sample of your patients a few times a year doesn’t mean you have to work with all of that paper every day of the year and forego the value and benefits of Metridoc.Our recommendation is to have the best of both worlds by using Metridoc for your every day routine processes and have Metridoc assist you in locating the original document from physical storage. Every search result in the Metridoc solution includes the date that the document was added to Metridoc (see Created column below). It is not necessary to file documents that are added to Metridoc in your filing cabinets becuase once a document is added to Metridoc you can retrieve it and make copies from the digital image that Metridoc manages for you. Original documents should be immediately archived to a storage box and we recommend that users keep a storage box next to their scanner so as the documents come out of the scanner they can go right into the storage box. The storage box should be labeled with two dates: the date you started using it and the date that it was filled and sealed.When it is necessary to locate the original document, using the Metridoc Created date, locate the correct storage box, and remove the document. Once you are through with the original document place it back in the storage box.Locating original documents can be made easier by using partitions in the storage box for your routine document types such as orders, prescriptions, vouchers, and at least one partition for DMERCs. Storing your original documents by date avoids the annual file purging project and easily identifies documents that you can destroy by looking at the dates on your storage boxes. There is no need to forego the value and benefits of Metridoc on a daily basis because of an occasional Medicare review or audit. Get Metridoc today and start saving your employees the time they spend filing, retrieving, purging, and destroying business documents as well as reduce the space those files are taking up in your office. The Health Insurance Portability and Accountability Act of 1996 (HIPAA) enforces healthcare data privacy, security and standard transaction data exchange between healthcare providers, insurance companies and employers. The security provisions that are imposed by HIPAA ensure confidentiality and unauthorized use of identifiable health information. The HIPAA privacy regulation protects against inappropriate use and limits the sharing of identifiable health information and before identifiable information can be released, authorization from the patient is required. Metridoc® is a HIPAA compliant solution and it supports the security and privacy regulations. As part of the HIPAA standards, each user must use a unique username and password in order access the system. Each time a user attempts to login to Metridoc, the system verifies the information to ensure that the user is authorized. This restricts unauthorized users from logging into to the system; therefore identifiable health information is secure and remains private. The system administrator is the only user who can create, edit and remove new accounts from the system. Along with creating usernames the system administrator regulates what a user can and can not do while in the system. For example, an office may have human resource department and a billing department. Each department wants to add their confidential documents to the system. The system administrator can create a document group called “Human Resource” and “Billing.” Each user is assigned to a document group, and the user can only access documents within their assigned group. If the user only belongs to the “Billing” group the user is unaware that the “Human Resource” group exists. The same policy is applied for editing, viewing or adding documents to the system. If the user is only granted permission to view documents within their document group, than the user is unable to edit or add documents to the system. Since the system administrator can control user activities in Metridoc, this limits unauthorized user from tampering with health data. Another security measure that is included with Metridoc is the automatic logoff feature. Metridoc will automatically end a user session after a period of inactivity. By default the automatic logout feature is set to end a user’s session if the user has been ideal longer than five minutes. The system administrator can configure the automatic logoff component to end a session after a longer period of inactivity, if desired. Metridoc uses an audit log to track and record user activities while in the system, which is another regulation enforced by HIPAA. Only the system administrator can access the audit log, and users are unaware that their activities are being monitored. The audit log records who viewed the document, and time and date of when the document was reviewed. Each interaction is recorded in the audit log which provides accurate records of user activities. 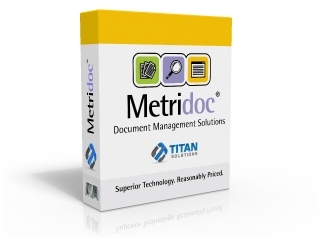 Titan Consulting Group, Inc. is pleased to announce the integration of the Metridoc® Document Management Solution with Universal Software Solution’s Healthcare Data Management Solutions (HDMS) and Plan of Service (POS) software products. Universal Software Solutions specializes in billing and order intake solutions for home medical equipment (HME) providers. The integration with Metridoc enables users to access document images from Metridoc by clicking a button in HDMS, and enables the use of the HDMS database to be used during the Metridoc document processing in order to identify and automatically catalog and index documents. Universal will also provide Metridoc support to their customers through their support/help desk. Existing and prospective Universal customers can purchase the Metridoc system and integration components directly from Universal which can be reached at (810)653-5000 or at sales@universalss.com. All documents are secure, requires user login and passwords, HIPAA compliant, and all document access is logged by the system. Browser based user interface that requires zero client installation. As simple as using a search engine like Google® or Yahoo®. Built using mainstream industry standard components such as Microsoft® .NET, SQL Server® and Adobe® PDF document formats. Do you know the cost of filing your paper documents? An employee spends 16 hours a week, 40% of their time, on filing and other paper document activities. Based on an annual salary of $24,960, or $12 per hour, plus taxes and benefits that is about $11,520 per employee per year. Professionals spend 5-15% of their time reading documents, but up to 50% of their time looking for them. On average, 19 copies are made of each paper document. 90% of the papers handled each day are merely shuffled. 25% of documents are misplaced or lost, 7.5% of all documents are lost forever, and it costs $150 in labor to find a misfiled document. On average, 19% of printed documents are wasted. Office employees spend a consistent 20-25% of their time seeking information; more effective search capabilities will save time and drop these percentages. Paper document mismanagement claims 12-15% of corporate revenue. That is $75,000 for every $500,000 of revenue. 85% percent of archived documents, meaning not active documents, never leave the filing cabinet and are just taking up space. What are the benefits of implementing a document management solution? 20-30% increase in productivity. Increase your work force by 1/3 without increasing labor costs. 20-40% savings on document handling. 20-40% improvements in cycle time. 30-50% savings on desk space. 30-50% improvement in customer satisfaction. Over 60% of all companies (the percentage is much higher for small to medium size businesses) still process, store, and retrieve documents manually. This means you can still get a jump on most of your competition by implementing Metridoc — before they do. Information Sources: Coopers & Lybrand, Xerox, A.T. Kearney, Benchmark Consulting International, Gartner Group, Cap Ventures, and AWV. Our mission is to assist customers in leveraging information technology to reach their business goals, and attain high standings in their industry. We are a solutions company, dedicated to excellence in the areas of customer service and technical ability. Thank you for your interest in Titan Solutions' products and services. To contact the sales team please call (586) 510-0011 or email us at: sales@titanmi.com. Titan Solutions is a dynamic and growing organization, where great work earns great rewards. Apply by email at: careers@titanmi.com. Titan Solutions provides unlimited product support on software. Email the support team at: support@titanmi.com. Smplify is a CSLA.NET business object C# source code generator that was designed to be robust yet simple to use especially for developers who are new to CSLA.NET.